On this date in 1939 Soviet Foreign Minister Vyacheslav Molotov presented to Adolf Hitler’s Mos­cow ambas­sa­dor a draft of a non­aggres­sion pact between the two powers. The draft con­tained essen­tially every­thing the Ger­man serial aggressor could have wished for because it opened the gates for crushing neigh­boring Poland and solving the pesky prob­lem of the “Polish Cor­ri­dor,” the strip of land that sep­a­rated East Prussia from the rest of Hitler’s Ger­many. For Soviet dic­ta­tor Joseph Stalin, the pro­posed mutual diplo­matic under­standing was viewed as the stepping stone for restoring lost terri­tories in the west (Bela­rus and the Ukraine) that had been ceded to Poland in the Treaty of Riga (March 18, 1921), which ended the Polish-Soviet War. Stalin’s “gene­ros­ity” came at a price: the non­aggres­sion pact could only come into force if the pact’s secret pro­to­col on future spheres of influ­ence between the two here­to­fore antag­o­nistic nations was signed at the same time. The secret pro­to­col divided Poland into spheres of in­flu­ence: Ger­man (West Poland) and Soviet (the “lost ter­ri­tories” in East­ern Poland). Poland’s neigh­bor to the north, Lithu­a­nia, fell into the Ger­man sphere of influ­ence because it was adja­cent to East Prussia (“EP” on the map below). Fin­land, the Bal­tic states of Lat­via and Esto­nia, and Bes­sa­rabia (which was part of Roma­nia), fell into the Soviet sphere. The ini­tial vivi­sec­tion of Cen­tral Europe had the poten­tial for “ter­ri­torial and poli­ti­cal rearrange­ments” as the two foxes rearranged the hen house after the outbreak of war in Europe. On August 20, 1939, Hitler agreed to Stalin’s demand and flew his foreign minis­ter, Joachim von Rib­ben­trop, to Mos­cow for the signing cere­mony. The Molo­tov-Ribben­trop Non­aggres­sion Pact, signed in the late hours of August 23, pro­vided for the ami­cable and imme­di­ate divi­sion of the coun­try that lay between the two super­powers—the mecha­nics and pro­to­col of which were well known because Czarist Rus­sia and Prus­sia had par­ti­tioned Poland three times before in the 18th century. Hitler un­leashed his forces on Poland on Septem­ber 1, 1939, and Stalin’s forces moved into Poland from the east on Septem­ber 17. On Septem­ber 27, 1939, after Soviet forces had reached the predefined Molo­tov-Rib­ben­trop border, Poland was erased from the map of Europe. 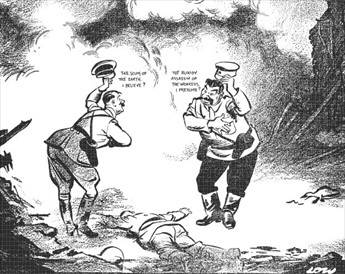 Left: “The Prussian Tribute in Moscow,” satirical car­toon of the August 1939 Molotov-Rib­ben­trop Non­aggres­sion Pact (aka Rib­ben­trop-Molotov Non­aggres­sion Pact). 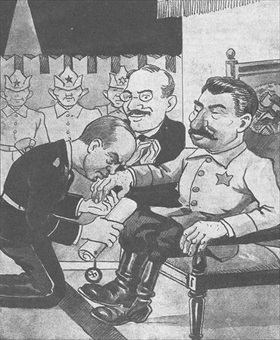 Published in Warsaw’s Mucha weekly, September 8, 1939. Left: Planned division of Central Europe according to the August 1939 Molotov-Rib­ben­trop Non­aggres­sion Pact. The yellow lines repre­sent the planned borders. The Soviet Union and the Soviet spheres of influ­ence are in red and tan, respec­tively. Germany and the German sphere of influence are in shades of blue. Right: Actual 1939–1940 territorial changes are depicted in this map. The yellow lines repre­sent the 1938 borders. 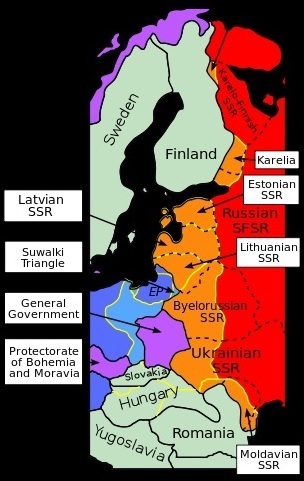 The dashed black lines repre­sent the bor­ders of the Soviet states (SSR=Soviet Socialist Repub­lic) in 1940. Ger­man annex­a­tions are shown in light blue. Purple depicts Ger­man-occupied ter­ri­tories and states: Norway, Central Poland, and Western Czechoslovakia.